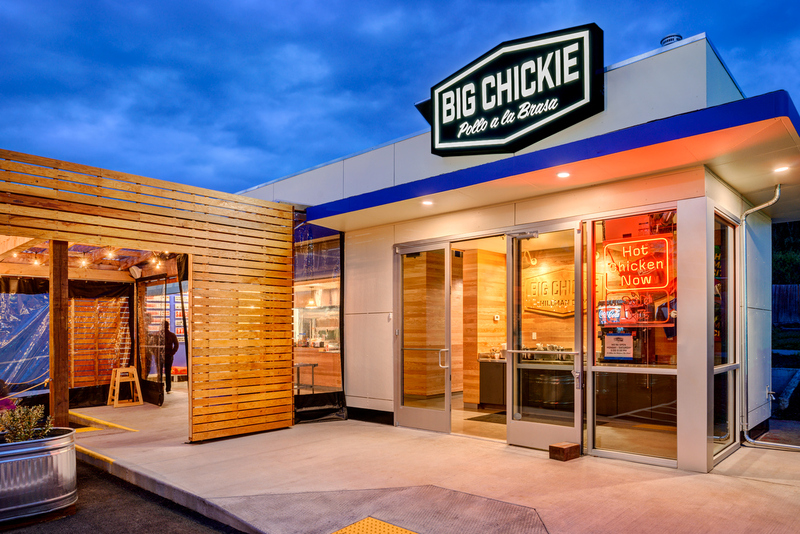 Big Chickie is a modern roadside chicken shack serving charcoal rotisserie chicken, homemade sides, salads, sandwiches, beer & wine. Dine in our covered enclosed patio or take it to go. You can order online and have your fresh food ready for pickup, or use one of our partner delivery services Doordash or Postmates. We're located in Hillman City, in the refurbished Rudy's Service station at the corner of Rainier Avenue S and S Findlay Street - just a few blocks south of Columbia City and one block north of Orcas Street. 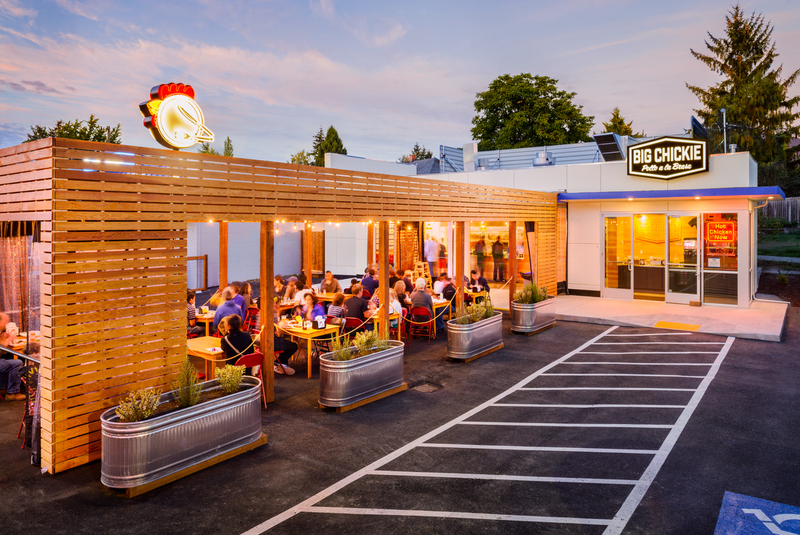 We opened Big Chickie in September 2014, following our extensive remodel of the long vacant Rudy’s service station in Hillman City. It’s our first and only restaurant, and it’s inspired by the things we love best: good food, friends, family and community. We make all of our food fresh right here in Hillman City. Growing up in the Washington D.C. suburbs, Peruvian style charcoal rotisserie chicken was my family’s go-to take-out meal. My parents lived in Peru for three years in the late 60’s and served in the Peace Corps. They brought back a love of the people and food of Peru, and shared that with me. Having moved to Seattle long ago, I found myself missing one of my all-time favorite meals. We knew we wanted to share charcoal rotisserie chicken (pollo a la brasa) with our community. The Peruvian charcoal rotisserie chicken (pollo a la brasa) I grew up with was amazing, but the sides were always limited to french fries and coleslaw. We knew we wanted to offer more, so we have worked hard to create a menu that satisfies our community. We offer 10+ homemade vegetarian sides, a variety of platters and a range of housemade sauces and salads, freshly baked corn muffins and tasty beer & wines. We like to think of our menu as modern comfort food. Of course, we still offer the french fries and coleslaw! Our awesome team is what makes Big Chickie great. Many of our team members are our neighbors here in Hillman City and in the Rainier Valley. We’re proud to employ so many local youth, and we support all of our team members in reaching their career and educational goals. Sara and I have made our home in South Seattle since 2009. This community means the world to us. We’re proud to raise our daughters here, and to serve great food and beer here. We are thankful to all our neighbors and fellow Hillman City business owners that make this such a great spot to be. Thanks for your business - we hope to see you again soon. Please note that we are closed many major holidays. Come see us for lunch! Tuesday thru Saturday we open at 11:00 am. No need to call. We're set up for speedy take out. All the food is ready, so just come on in. Order Online to have your food ready for pickup, or use our partner delivery service. Looking to feed a small gathering or a big crowd? We have just the thing for you! Having trouble deciding on only two veggie sides? Well, order an extra side, an extra chicken or two, some more sauce... You know you love it all! Please order online. Follow the ORDER ONLINE link. Select the "Order for Later" option, and then look for the Party Pack option. Remember to order 24 hours in advance. Party Packs are for pick up only. Have questions? Feel free to email info@bigchickie.com. Does Big Chickie do full service Catering? We can offer catering for some events based on our team availability. Send us an email at info@bigchickie.com or call us at (206) 946-1519 to discuss the particulars of your event. From there, we can determine our ability to meet the needs of your event. Please note that party pack pricing does not apply for catered events. Can I order a party pack for today? We request that you order at a minimum of 24 hours before you pick up. If you are in bind with a last-minute event, give us a call and we'll see what we can do. We do offer delivery in a limited area through our partner delivery organization. Please note that delivery is dropoff delivery only and does not include any setup. Please contact us with at least 48 hours notice to set up a delivery catering order. We will develop a custom quote for you that includes the delivery fees. Do you offer staffing for events? With advance notice we can deliver food and staff an event. Please note that party pack pricing does not apply for catered events. Are plates, forks, knives and napkins included? For an extra charge, we would be happy to provide you with compostable, plates, forks, knives and napkins for your meal. Order a service package for 20 place settings with your catering order, and we will include everything you need! Is there a service charge for these large orders? We don't include a service charge. However, we do ask that you consider leaving a gratuity for our team. They work hard to cook and carefully package your food. Please show them some love! Please pay online with a credit card in advance to reserve you order. Can I call in my order for 2 chickens? While we don't accept phone orders, you can now order your 2 chickens or even 1/4 white online. ORDER ONLINE!